In preparation for the New York Comic Con, the Brooklyn Public Library will present a lecture on Wednesday, February 4th, 2009. Paolo Rivera, a professional comic book artist since 2002, will give a talk on his career and creative process. The lecture will begin at 7:00pm in the Dweck Center of the Central Library on Grand Army Plaza. Rivera has worked for Marvel Comics on some of their best-known characters, from the X-Men to Captain America. In 2008, collaborating with writer Paul Jenkins, he completed Mythos, a fully-painted collection of origin stories featuring Marvel’s greatest superheroes. With the hardcover now published, Rivera divides his time between The Amazing Spider-Man and painted covers for various titles. 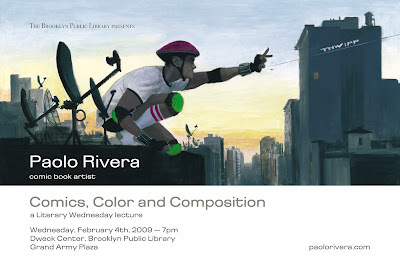 The lecture will focus on Rivera’s career path, as well as the extensive process of creating a single comic book page. In addition, he’ll explore some of the practical theories behind legible artwork, from color and composition to gesture and perspective. Free to the public and open to all ages, the lecture will be followed by a question and answer session (so future comic book artists are welcome). I was curious if this lecture is going to recorded, I'm not in New York but am very interested in what you have to say. Hey guys, thanks for your interest. I am making inquiries. I believe that the lecture will be recorded by the library, but I don't know if I'll have access to the video, or if it will be made public. At the very least, I'll make some of the text available in a future post. I'm a great fan of your work and I follow regularly your very interesting blog (love your tutorials and wacky references!). As you probably know since I'm purchasing some of your art next week, I'm an original art collector. I have the privilege to already own a couple of your pieces. and in person they are even greater than they are published. In fact, it was somehow disappointing to see how much was lost in reproduction, so it's a relief to see the original images in your site and in your art dealer's site. BTW, I learnt that you're doing the variant cover for Spider-Man #590. Since it's not shown at solicitations, are you going to post it here? I loved your work on Spider-Man 577, and I was lucky enough to download all the images of the issue from ComicSplashArt. In b&w, your work rocks! I'm looking forward to read the text of the lecture in your blog since I won't be able to be in NY to attend it. I can see that you also are going to illustrate the Ms. Marvel #38 and Spm #592 variant covers. It's great to see more work from you! First of all, thanks for picking up the original artwork. It's always a nice surprise to get a call from my art dealer. As for the reproduction, it's been a constant battle since I began working for Marvel. I've got it mostly down at this point, but it's one main reason I switched to inked artwork. As for covers, I'm in the middle of about 6 right now. I'll post them as soon as I get permission from Marvel. I just got an e-mail from NYCC mentioning this, otherwise I would've never known. I am beyond excited and will finally venture in Brooklyn after what seems like ages for this.